The world's largest, busiest fish market has long been a favorite destination for jet-lagged tourists with predawn hours to fill. 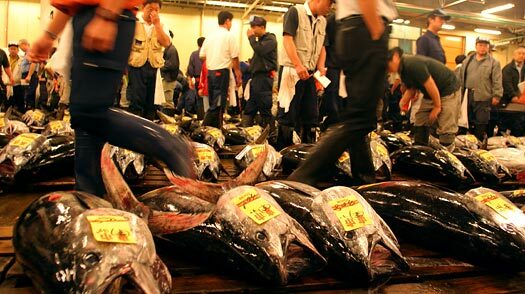 But the main reason for going at 5 a.m. is to catch the live tuna auctions. Before you go, however, be sure to check this website to see if public access is permitted that day. If so, it will be on a first-come, first-serve basis, and limited to 120 people, admitted in two shifts of 60. You can register starting at 4:30 a.m. at the fish information center inside the Kachidoki Gate off Harumi Street. If you prefer to do your exploring at a more reasonable hour, keep in mind that by 9 a.m., business will have already started to wind down. You'll still see fishmongers filleting the day's catch, but you won't have to dodge so many trucks and trolleys. It's been said that no visit to Tsukiji is complete without a sushi breakfast. There are plenty of sushi counters here, but to find best ones, you need to wend your way to the restaurant area near the wholesale fruit and vegetable market, just inside the main gate off Shin-ohashi Street. To get there, walk in from the gate, with the fruit and vegetable market on your right, pass the off-limits loading zone (with its stacks of polystyrene boxes) and turn left at the main road. Walk three short blocks, then turn left again down a small side street. Sushi Dai is the second shop on your right. Look for the faded green doorway curtains and very long line out front. Daiwa-Zushi, a bit farther down on the same side of the street (curtains are red), is just as good. Expect to pay between 300 and 800 yen per generously cut, amazingly fresh piece. Order the chu toro (fatty tuna). To help get your bearings, click on this map. If the wholesale market smells too fishy for you, a less pungent alternative is Tsukiji's outer market, a warren of narrow streets packed with stalls selling fresh seafood and other specialty items, such as real wasabi. You can buy bowls and sashimi knives there too. Right in the thick of it is the reliably superb Sushizanmai's honten (main branch), open 24 hours. Take the Oedo line to Tsukiji-Shijo station, exit A1. You can also take the Hibiya line of the Tokyo Metro to Tsukiji station. Tokyo Guide: Find travel deals, hotels and more!